Constellation Orion the Hunter is a southern constellation sitting below constellation Taurus and above constellation Leups. Orion spans nearly 20 degrees of the Zodiac in the Sign of Gemini, and contains 13 named fixed stars. The giant Orion was created out of an ox-hide by the Gods, Jupiter, Neptune and Mercury, at the request of Hyreus who had entertained them. He was blinded by Oenopion (the name means “wine-faced”) for having raped Merope, Oenopion’s daughter, but recovered his sight by exposing his eyes to the rising sun. In consequence of his boast that he could slay any beast bred upon the earth the scorpion (Scorpius) was brought forth and Orion died from its sting. The head is marked by lambda, phi1, and phi², the stars alpha (Betelgeuse) and gamma (Bellatrix) pointing out the shoulders, beta (Rigel) and kappa (Saiph) the left foot and right knee. But Sir John Herschel observed from southern latitudes that the inverted view of the constellation well represents a human figure; the stars that we imagine the shoulders appearing for the knees, Rigel forming the head, and Cursa of Eridanus, one of the shoulders. In astrology the constellation was Hyreides, Bayer’s Hyriades, from Ovid’s allusion to it as Hyriea proles, thus recalling the fabled origin from the bull’s hide still marked out in the sky. This, formerly depicted as a shield of rawhide, is now figured as a lion’s skin; and it perhaps was this Hyriean story that gave the stellar Orion the astrological reputation, recorded by Thomas Hood, of being “the verie cutthrote of cattle “; at all events, it certainly gave rise to the tripatros and Tripater, applied to him. Near neighbor to the Twins, Orion may be seen stretching his arms over a vast expanse of sky and rising to the stars with no less huge a stride. A single light marks each of his shining shoulders, and three aslant trace the downward line of his sword: but three mark Orion’s head, which is embedded in high heaven with his countenance remote. It is Orion who leads the constellations as they speed over the full circuit of heaven. This picture is to show that the coming one is no mere animal, but a man: a mighty, triumphant, glorious prince. 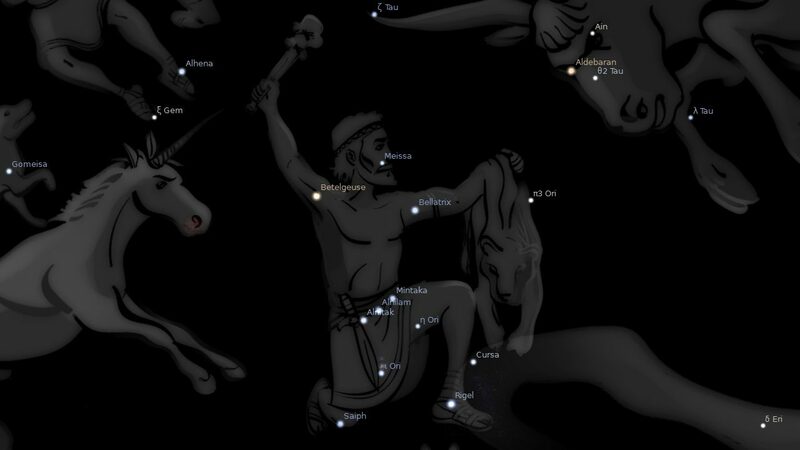 He is so pictured in the ancient Denderah Zodiac, where we see a man coming forth pointing to the three bright stars (Rigel, Bellatrix, and Betelgeuse) as his. His name is given as Ha-ga-t, which means this is he who triumphs. The hieroglyphic characters below read Oar. Orion was anciently spelt Oarion, from the Hebrew root, which means light. So that Orion means coming forth as light. The ancient Akkadian was Ur-ana, the light of heaven. Orion is the most brilliant of all the constellations, and when he comes to the meridian he is accompanied by several adjacent constellations of great splendor. There is then above the horizon the most glorious view of the celestial bodies that the starry firmament affords; and this magnificent view is visible to all the habitable world, because the equinoctial line (or solstitial colure) passes nearly through the middle of Orion. The picture presents us with “the Light of the world.” His left foot is significantly placed upon the head of the enemy. He is girded with a glorious girdle, studded with three brilliant stars; and upon this girdle is hung a sharp sword. Its handle proves that this mighty Prince is come forth in a new character. He is again proved to be “the Lamb that was slain,” for the hilt of this sword is in the form of the head and body of a lamb. 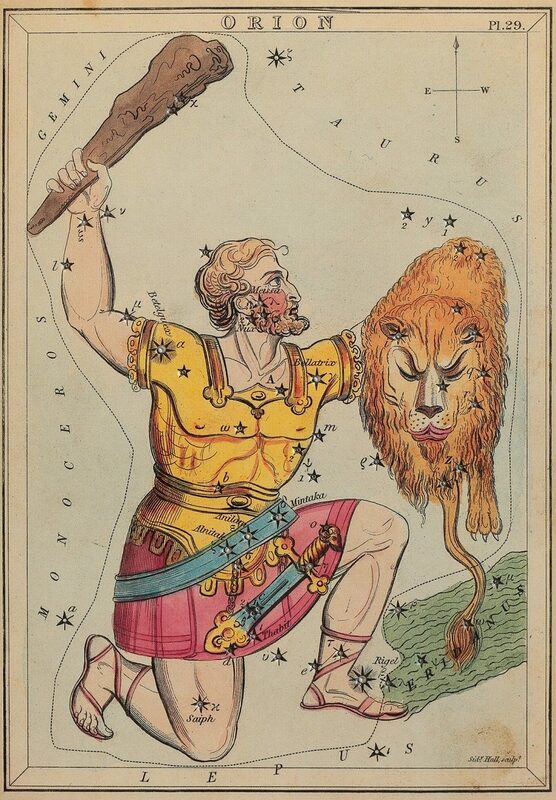 In his right hand he lifts on high his mighty club; while in his left he holds forth the token of his victory–the head and skin of the “roaring lion.” We ask in wonder, “Who is this?” and the names of the stars give us the answer. The brightest, α (in the right shoulder), is named Betelgeuz, which means the coming (Mal 3:2) of the branch. The next, β (in the left foot), is named Rigel, or Rigol, which means the foot that crusheth. The foot is lifted up, and placed immediately over the head of the enemy, as though in the very act of crushing it. Thus, the name of the star bespeaks the act. The next star, γ (in the left shoulder), is called Bellatrix, which means quickly coming, or swiftly destroying. The name of the fourth star, δ (one of the three in the belt), carries us back to the old, old story, that this glorious One was once humbled; that His heel was once bruised. Its name is Al Nitak, the wounded One. * Similarly the star κ (in the right leg) is called Saiph, bruised, which is the very word used in Genesis 3:15, thus connecting Orion with the primeval prophecy. Like Ophiuchus, he has one leg bruised; while, with the other, he is crushing the enemy under foot. * The star ζ (in the belt) is called Mintaka, dividing, as a sacrifice (Lev 8:2). 1. Fixed Stars and Constellations in Astrology, Vivian E. Robson, 1923, p.55. 2. Star Names: Their Lore and Meaning, Richard H. Allen, 1889, p.303-308. 3. Astronomica, Manilius, 1st century AD, p.35, 305. 4. The Witness of the Stars, E. W. Bullinger, 29. Orion (the Glorious One).